a friday ritual. one photo of the past week, with a moment i want to savour and remember. Sylvia, looks like it has warmed up there. That is a lovely spring garden. I love the intensity of the colors in this picture and the perspective is equally delightful! We are not having luck at the moment with our veggies, to say the least. It is quite sad to look at it, really, I just don't know what to do! hmph! It's looking great! I can't wait until I can put our little seedlings outside! I always love how a little garden is full of hope. What is he planting? Little hands in a garden, what a beautiful sight! Here are my two rediscovering the creek they know and love after the long winter's freeze. Our moment this week comes from the Cardboard City that Grace's Girl Scout troop created on Tuesday! Each girl had to make a building that would be found in a city or town. Grace was given a flower shop to create. The picture says the rest! Little Ones + Gardens = Whatlifeis allabout! Ah! 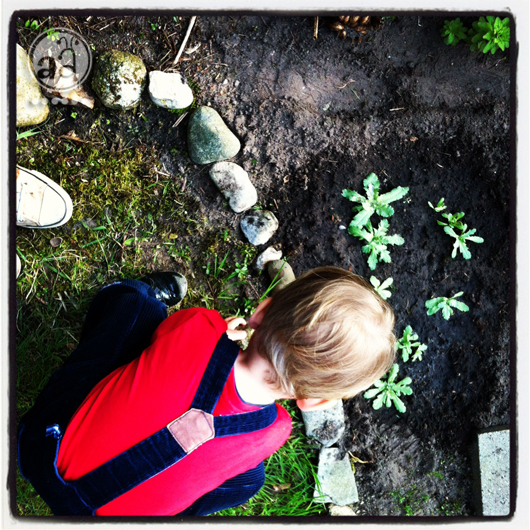 Starting them in the garden at an early age is always a great idea! Have a great weekend! Looks so peaceful and wonderful. Makes me want to dig right in too. so bright and hopeful! great catch, mama! hope your weekend is a lot of fun and involves even more dirt. Little garden helpers are the best. Happy weekend! What a lovely little garden! Thanks for sharing and for visiting my moment today too. Happy weekend! What are you guys planting? Wishing you a sunshiny weekend! Hugs! Sweet Spencer! I espially liked the moment right after you took this photo, when he started to sweep that flower bed!